Domestic Violence Awareness Month at Belmont University in Nashville, Tenn. September 27, 2016. Did you know that nearly half—43 percent—of dating college women report experiencing violent and abusive dating behaviors? Moreover, college students report that they do not feel equipped to deal with dating abuse–57 percent say it’s difficult to identify and 58 percent say they don’t know how to help someone who’s experiencing it. These statistics, as reported in a 2012 article in Campus Safety magazine, indicate there’s still plenty of work to do around the nation and here at Belmont to educate men and women about domestic violence. With October serving as Domestic Violence Awareness Month, Campus Security is partnering with several departments and student organizations across Belmont to host awareness events over the next several weeks. Part of creating and fostering that culture begins when students first arrive to campus. 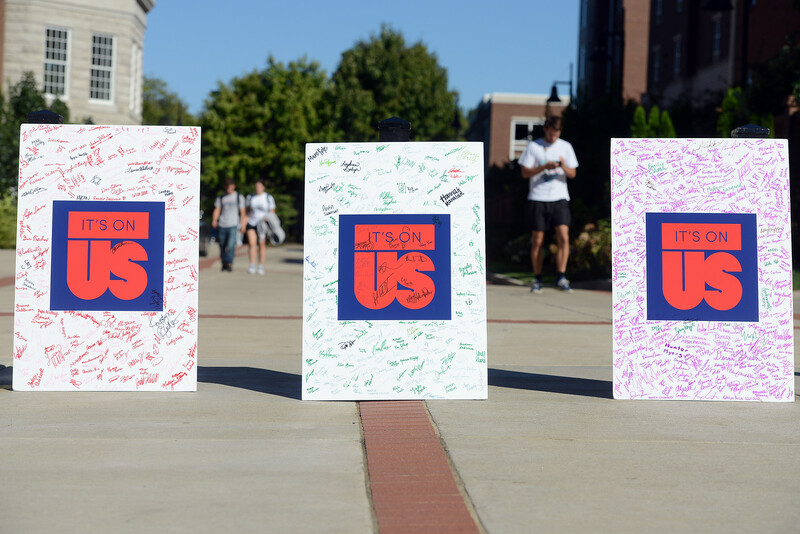 This fall hundreds of new Belmont freshmen took the “It’s On Us” pledge to prevent sexual assault as part of Welcome Week programming at the beginning of the semester, signing large posters to publicly show their support. The national “It’s On Us” campaign, which began two years ago, seeks to reframe the conversation surrounding sexual assault in a way that empowers, educates and engages college students to prevent it. Since the launch of the campaign in September 2014, more than 275,000 individuals have taken the It’s On Us pledge, and Belmont is one of more than 480 schools to host It’s On Us events. As part of Belmont’s month-long awareness campaign, the Welcome Week It’s On Us signed posters will be displayed throughout campus in October, beginning for one-week in Bunch Library followed by the Beaman lobby, Harrington Place Dining and the Ayers Academic Center lobby. In addition, several events are scheduled during the month including a convocation and “It’s On Us” pledge drive on Fri., Oct. 14. The 10 a.m. convo will discuss what it means to be an active bystander and give practical strategies for bystander intervention. In addition to promoting the pledge on ItsOnUs.org at that event, Campus Security, SGA and Student Affairs will partner in that evening’s Live On Fridays programming to provide additional opportunities to sign the pledge. The following week will bring the “One Love Escalation Workshop” about dating and relationship violence on Wed., Oct. 19 at 5 p.m. in McWhorter 109 and a “Basic Self-Defense workshop” on Thurs., Oct. 20 at 6 p.m. in the Vince Gill Room. To learn more about Belmont’s sexual violence prevention awareness efforts and on campus resources, please visit www.belmont.edu/sexualviolenceprevention. And for more information about how to get involved, email securityprograms@belmont.edu.